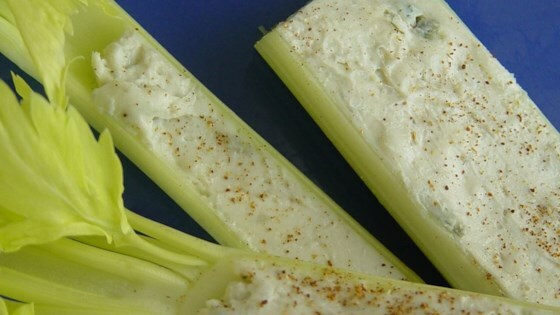 "Spicy and low-carb, this savory stuffed celery makes a great appetizer. This recipe was originally submitted to ThanksgivingRecipe.com. Serve with black and green olives, and red pepper rings to garnish." Arrange celery pieces on a serving platter. In a medium-sized mixing bowl, combine cream cheese, blue cheese, Worcestershire sauce, hot pepper sauce, lemon juice and black pepper. Blend well. Stuff each piece of celery with the cheese mixture. I made this at Thanksgiving and everyone loved it. It's a great twist on the plain cream cheese version. Thanks! Very yummy! Tastes like I mini cheese ball stuffed into a piece of celery. Completely hits the spot!! I followed the recipe exactly and think that there is WAY too much Worscheshire.... very overpowering taste. I may try to make this again without it, or use just a 1/4 tsp.